OK, I know it is Monday but I have this new idea and I am already a day behind! Every Sunday I will be featuring a beautiful saucer out of my collection. I will try to provide as much information about it as I possibly can. The saucer will eventually be made into a stunning ring holder, but until then, it will be admired on my shelf with the rest of my saucer collection. 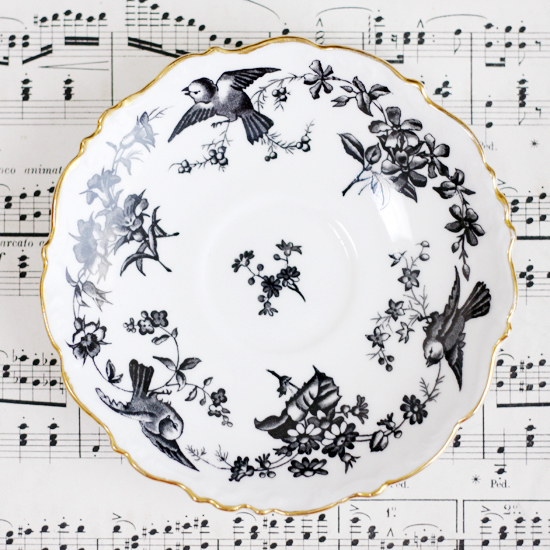 This saucer was manufactured by Coalport. Unfortunately, this beautiful design does not have a pattern name. I like it when there is a name because it usually hints to the design of the saucer and then it is easy to reference to it later. But if this saucer had a name, it would be something like ‘Meadow Birds’. What would you call it? I would love to know your ideas so please leave a comment below. Coalport is an English china manufacturer founded by John Rose (1772-1841) after he had trained as a potter in Caughley, Shropshire, under Thomas Turner, a potter with a revolutionary approach to making porcelain. After the Great Depression, Coalport was sold to English china manufacturer Cauldron Works. In the end, this resulted in the closure of the Coalport factory. In 1967, Wedwood purchased Coalport. As a result, Coalport is now produced at the Wedgwood factory in the village of Barlaston, Staffordshire, in the Potters region of England. Maybe it's the sheet music inspiring me, but I'm going with "a winter's song"